"We found Jay to be extremely pleasant and easy to work with. Stayed in touch with us for over a year since we lived out of town and kept us informed as to what was going on in the market. We enjoyed his quick wit and since of humor. I would highly recommend him." Do the right thing is my guiding principle. Your interest as a home buyer or a home seller is my top priority. I am always available on my mobile phone and try always to answer my calls. If I am not available to answer your call, I will get back to you as soon as possible and at the very minimum by the end of the day. I am also available by text or email. 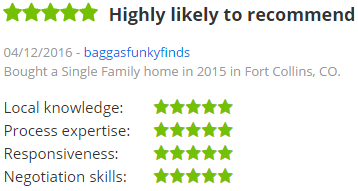 Being a full time residential Realtor here in Northern Colorado since 1988, I understand that no two buyers or sellers are alike and also that no two transactions alike. Focusing on your individual needs, I try to communicate the risks and rewards in every issue so that you have a full understanding.